With their strong attractive aluminium frames and flawless sight-lines, our Falcon Windows roof lanterns offer an exceptional showpiece to your home, transmitting natural sunlight that will transform any dark, inert room into a well-lit, perfectly ventilated energy-efficient extension. 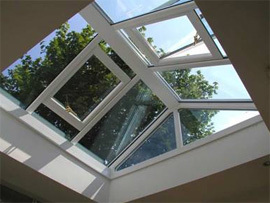 Roof lanterns offer the most beautiful and varied light effects during the day, are stunning to look at and allow views of the sky and stars at night. With market-leading technology and slim sight-lines our Falcon Windows roof lanterns based in Ipswich Suffolk soon turn your standard extension or orangery into a show house which you'll be proud of to share with your family and friends. At Falcon Windows, our roof lanterns are constructed from robust aluminium and incorporate the latest insulated sealed units with self-cleaning toughened aqua and blue tinted high-performance glazing. Not only will the roof lantern stay clean so you can see the difference, but you'll soon feel the difference too, thanks to the first class insulation technologies. These offer optimum insulation and achieve extremely low U values of 1.1w/m2K, saving you money on your heating bills. 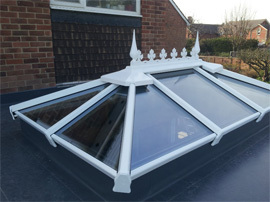 What's more, depending on size of the roof lantern, Falcon Windows installers will normally take just a day complete a roof lantern installation, although very large ones may take two days. Opening vents can be selected to allow heat out in the summer months and let fresh air in. Spotlights with dimmers inside are popular options which give a real classic look of an evening and allow one to have as much light as possible not just in the evening, but during the day as well. Thanks to the incredible range of RAL colours available, Falcon Windows can customise your roof lantern to fit your exact specifications, so that it can match perfectly into your existing roof structure. Roof lanterns can even be fitted onto small height frames to give added height and a totally different look, as shown in the picture here. 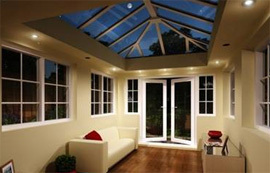 Roof lanterns are just one way to help really enjoy natural light in your home. Long gone are the days of window tax, so there's every reason to make the most of free natural light. Roof lights really deliver a bright, relaxed and airy feel to any extension or orangery, so you can sit back and enjoy, maybe with the Sunday paper or even a glass of wine perhaps! Why not transform your standard extension or orangery into a room with real wow factor, by allowing natural light to cascade down onto the floor area? The sky will come into its own at night and there are no more drumming sounds from the rain which one would otherwise get from a polycarbonate roof on a standard conservatory. 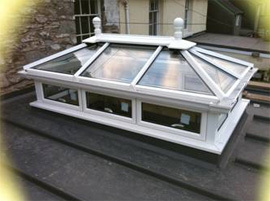 The sky really is the limit with a well-installed roof lantern form Falcon Windows in Ipswich. Do give us a ring on (01473) 288690 for one of our representatives to quote you via email for your requirements. We look forward to hearing from you and making your world brighter!